Organized every Monday between April – October, only. PRICES: All travel agents, in Greece and worldwide, offer the same tour at different prices. We believe that our prices for this tour is not matched by any other company. After 60 years organizing tours throughout Greece we have secured the best deals in all aspects of travel. * Under 19 and E.U.students are free of charge. NAFPLION – the “Venice” of Greece Modern architecture hasn’t spoiled the old town of Nafplion, which is a feast for the eye. 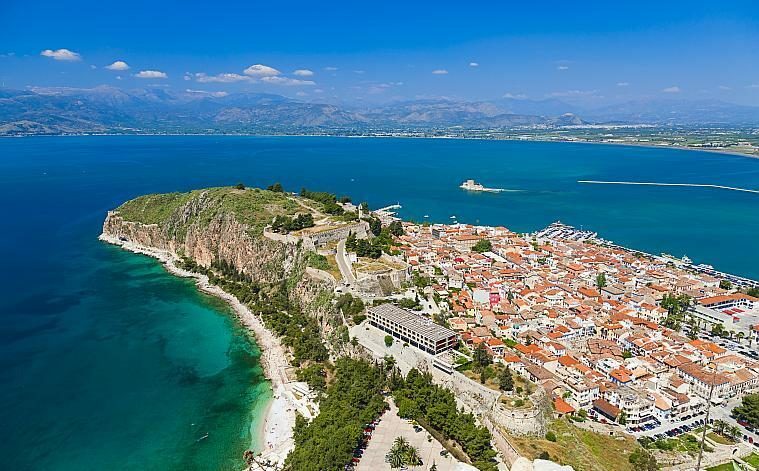 Nafplion was the capital of the Greek state in the early 1830s. Here, is the first residential palace for the young Bavarian Prince, Otto, the first king of the new country after the revolution against the Turks. The old town is beautiful, with old mansions and paved roads. The town’s fortresses, the Palamidi and the Akronafplia, played a key role during the war of independence. Frankish, Venetian and Turkish conquerors left their signature in the town and strongly influenced its culture, architecture and traditions during the years of occupation. Ancient walls, medieval castles, monuments and statues, Ottoman fountains and Venetian or neoclassical buildings attract the visitor with their unique architecture and beauty. Juniors under 19, and E.U. students are free to enter sites & museums. – Start the communication, and choose the agent that offers the tour at the price that suits your budget.